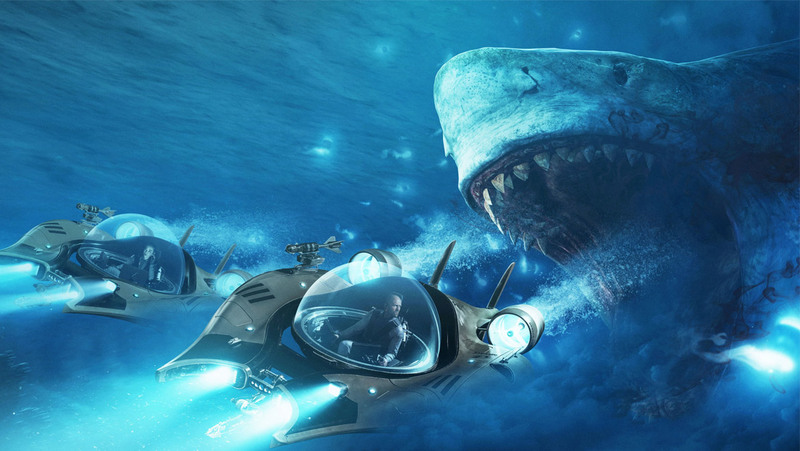 The B-movie blockbuster hopeful The Meg brings terror and the biggest shark ever to grace the screens of a multiplex. It has an appropriately diverse roster to play the usual action roles. Alpha male muscle comes in the form of Jason Statham as sea rescue diver Jonas Taylor, and standing in for the preresquisite cynical yet fetching scientist and tough girl with grit are Chinese superstar Li Bingbing as Suyin, and soon-to-be Batwoman Ruby Rose and as crew member Jaxx. Taiwanese indie film darling Winston Chao plays Suyin’s world weary oceanographer father Zhang, and Cliff Curtis, late of Fear the Walking Dead, is problem solver and voice of reason Mac. These characters are thrown together for various professional reasons on state-of-the-art research vessel Mana One. It floats atop the ocean, while underneath and at the bottom of the sea lies a trapped and damaged submersible, with Taylor’s ex wife at the helm. Taylor has been called in because his former cry of “SHARK!” or rather “MEGALODON! aka formerly believed extinct creature and biggest shark in the history of the world!” makes him somehow more credible and capable of saving the day. Some years ago, his warning of the meg’s existence, and his offer of it as explanation for the loss of his crew, was met with ridicule. It led to his dishonorable discharge. He plans to save his ex and redeem himself, even if it means a suicide mission. Audiences have gotten lulled into believing nearly any bad script or derivative concept can be made better by the addition of Dwayne Johnson. Whether as a producer or just as a power A-list player, Johnson seems to be able to wring out some laughs both at himself and at the proceedings, such that viewers don’t mind being taken on a silly ride. Not so with Jason Statham. No doubt he’s a delightful dude in real life, (or at least one hopes, given how often and for how long he’s been cast in Hollywood) but in films, he always seems a bit too serious, coming off as dour. Granted, often he is playing characters that come in and have to get serious about busting heads or breaking bodies or whatever the action flick he’s signed on to demands, but in a film like The Meg it just doesn’t work. Needed is a lead character and actor who can find time to brings laughs and a lightness to a dire situation. Had Johnson been the lead, he would have either had the script changed, or found a way to lighten it up. Who can say if Statham has that power, but suffice to say, that’s why Dwayne Johnson deserves the big bucks. The superior acting skills and charisma of both Cliff Curtis and Winston Chao are woefully wasted, although no doubt to financial reward, and the movie was filmed around New Zealand, so it can’t have been a huge chore for native Kiwi Curtis. The film is an American-Chinese co-production, and as such has some of the biggest stars to tempt Chinese filmgoers, and Statham is a known international box office draw, thereby making The Meg a Teflon release. It doesn’t matter how good or bad it is, as long as the creature shows up at close enough intervals. There is some fun and thrills to be had, although nearly all cobbled together from what has gone before. Does it matter? They’ve remixed scenes enough to keep the interest of both the casual movie thrill seeker and the Jaws super fan, who has committed the movie’s dialogue from beginning to end to memory. A diehard lover of the 1975 classic can only watch it so many times without friends and family seeing onscreen again rolling their eyes. The Meg is for them, and the filmmakers know it.